How does the live optimisation feature work? The live optimisation feature is a feature in the editor that gives your page a score that’s based on SEO elements. To know more about the editor take a look at this article and if you want to know more about creating a page go to this article. This article shows you how the live optimisation feature is structured. While writing your text in the editor, multiple suggestions to improve your text appear in the sidebar on the right. These suggestions tells you how to improve your text for the search engines and also how to structure your text for your readers. Following these suggestions, will raise your optimization score! Your page score is based on multiple SEO rules. This score show you how far your page is optimized. The score depends on the factors below the page score. Such as the factor that is indicated by the grey arrow. This is the page title, the page title is not only important for you, it’s also important for search engines. Think of a catchy title that will trigger a user to visit your website when it’s listed in the search results. A well optimized page title contains at least eight characters, three words and your keyword. The page description is indicated by the black arrow. With a page description you’ll make sure that users get to know what your website is about. Your page description should contain at least nine characters, two words and your keyword. 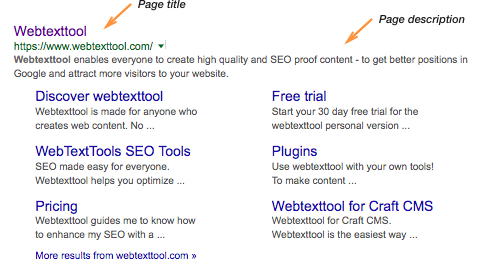 The image below shows how your page title and page description looks in the search results. The orange arrow in the image above is pointing at the page score. Your page score is based on multiple SEO rules. This score show you how far your page is optimized. The score depends on the factors below the page score. The red arrow is pointing at heading 1 (H1) / the header. This is used as the title of your text. A heading 1 is a readable introduction of your page. Make sure your heading 1 / header contains your keyword. It is also important that you use a heading 2 to 6, indicated by the green arrow. You can use these smaller headings in your text to highlight or summarize paragraphs. A heading 2 to 6 should also contain your keyword. To know more about creating headings, take a look at this article. The orange arrow in the image above is point at bold text. Using your keyword in bold text will indicate to the search engine that your keyword is important. The grey arrow is point at italic text. Make sure you’ll use your keyword in a italic text at least once. The body is indicated by the black arrow. The body measures the overall content of your page. This is based on the amount of words in your text, that should be at least 239. The keyword density is also important, this should be at least 1%. The keyword density is based on the number of times your keyword is called in the text. 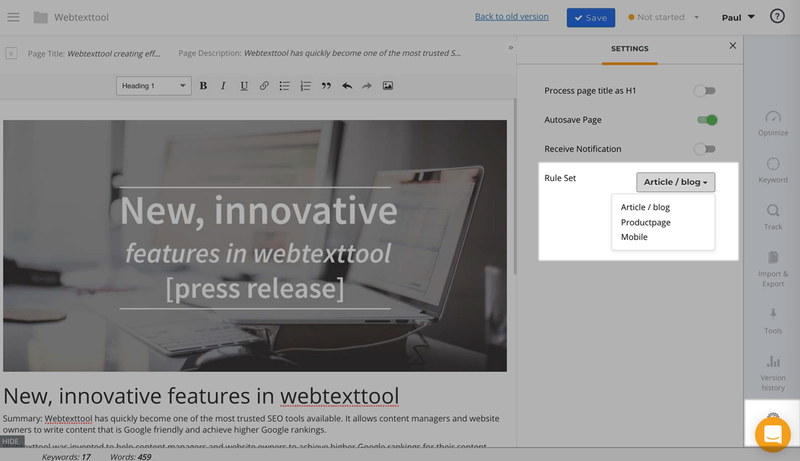 The rule set option allows you to choose between a article/blog page and a product page. These two text types have a different ruleset in the field of SEO. You can choose for article/blog page for optimizing pages that contain a significant amount of content, like blog posts. When you want to optimize a page that has less content, like a product description page for a webshop, you should choose product page. This ruleset is a bit less strict on content size. When you click on rule set, you can choose between article/blog page and product page. Now your text will be optimized on the right ruleset!